I am currently the leader of the World Cube Association Software Team. You can find me on GitHub as jfly. Learn more about me here. Eitan created a beautiful laser cut plastic passport out of these two patterns. Almost immediately, I knew I wasn’t going to solve this puzzle by hand. During a flight to Wisconsin yesterday, I got a chance to code up a solution in Python 3 (see GitHub). 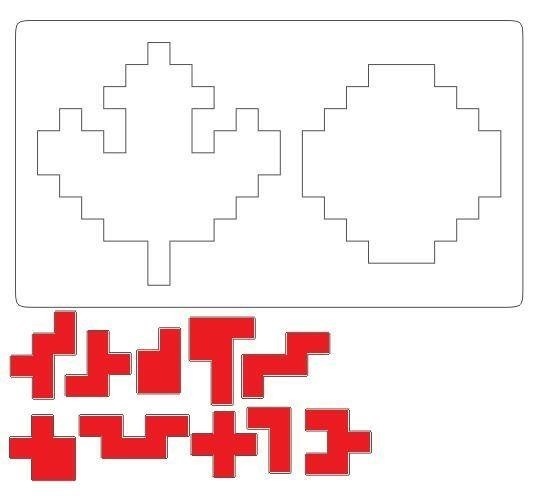 To avoid spoilers, I won’t post the solutions here, but you can find all the solutions to the maple leaf here, and all the solutions to the sun here. My implementation was straightforward BFS with some pruning (if we ever end up in a position where we’ve created islands smaller than our smallest piece, there’s no need to keep searching). I made no attempt to parallelize or to reduce via symmetry. Solving the maple leaf starting with the stem took 6 minutes on my laptop, and the sun took 1.6 hours. I used this as an opportunity to try out some ideas that have been bouncing around in my head since watching this video on functional programming. I definitely want to try out a real functional programming language next. A competitor is called to bring up his solved cube and place it on a blank scorecard. A scrambler scrambles that cube, using the scorecard to determine which scramble to give the competitor. A runner carries that scrambled cube to a timing station along with the scorecard. At the timing station, a judge performs the judging ritual prescribed in the WCA regulations. The judge writes the competitor’s solve time on the scorecard. Both the judge and the competitor sign the sheet. A runner carries the competitor’s scorecard and solved cube back to the scrambling station. Repeat steps 2-6 until the competitor has done all of his solves. The completed scorecard is given to a staff member whose sole job is to manually enter all the times into a computer. Data entry is a mind-numbing, error-prone job. C.A.L. Cube Timer (CCT) leveraged the stackmat’s display port to plug stackmats into computers. Why not do the same thing to automate data entry at competitions? As cool as opencubeware is, I believe it’s not the right direction for us to go in. Building a custom piece of hardware is expensive and inflexible. Today, smartphones are ubiquitous and cheap, and they can be programmed to do almost anything we want. I believe we can build a more secure, reliable, easy to use results system on commodity cell phones than we could ever achieve by building our own custom device. 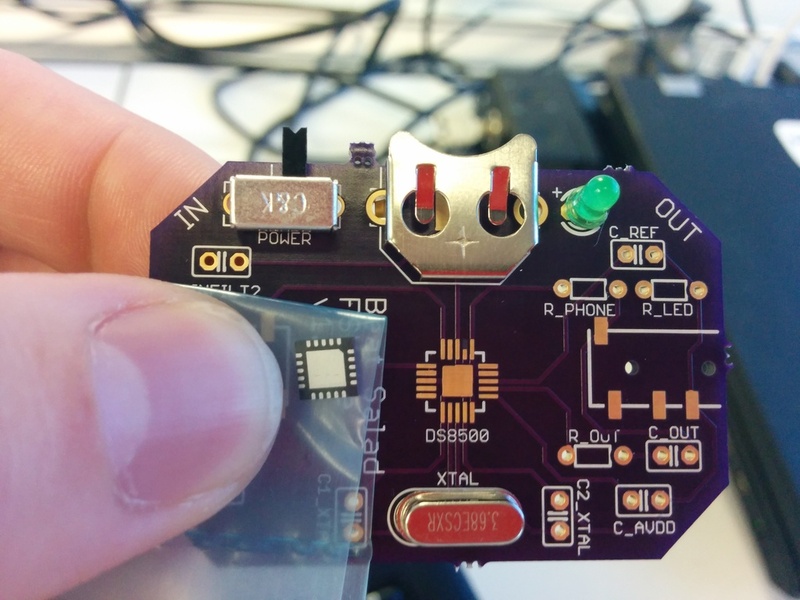 It’s easier to create an android app than it is to write firmware for a microcontroller. Furthermore, touch screens allow for a better, more flexible user interface, and phones already have Wi-Fi, cameras, and some even support NFC. Why hasn’t this already been done? Unfortunately, it turns out that plugging a stackmat into a phone isn’t as straightforward as plugging a stackmat into a computer (as CCT did). Dan Cohen wrote a stackmat interpreter in Objective-C in July 2010. He got it working in the iPhone simulator on his computer, but when he loaded it onto his phone, it just didn’t work. The signal he recorded was so distorted as to be unreadable. 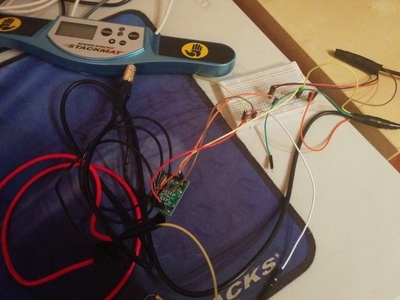 In February 2012, I attended a hackathon at Berkeley with the intent of writing a stackmat to phone interpreter. I was joined by Kevin Jorgensen, Darren Kwong, and Devin Corr-Robinett. After a few hours, we ran into the distortion that had thwarted Dan Cohen. I’m a software guy. This signal filled me with a combination of dread and regret that I had not attended more of Professor Boser’s 8am EE42 lectures. Unable to proceed without a better understanding of what was going on, we gave up. It wasn’t until January 2014 that I revisited the problem. One day at work, my coworker Eithan Shavit caught me looking at pictures of stackmat signals. As luck would have it, Eithan studied Electrical Engineering before getting a job in software. He was interested in the distorted signal and was able to shed some light on what was going on. Amazingly enough, phones are designed to record human voice. Human speech contains a large range of frequencies, approximately 300 Hz to 3400 Hz, to understand what somebody is saying. Phones can drop frequencies outside of that range if they want to, but they must preserve all frequencies within that range. To approximate the square wave (in red), add together all the component sine waves. 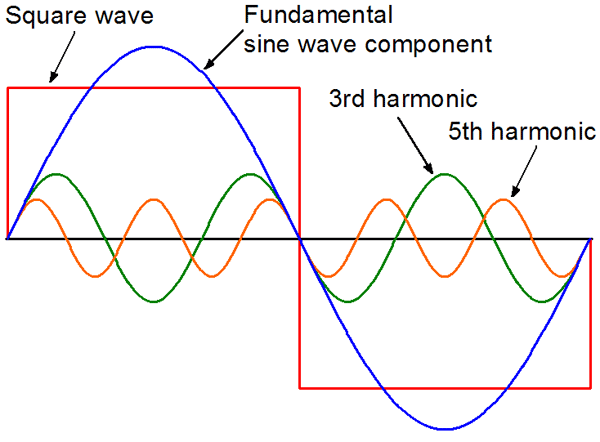 The low frequency blue wave builds most of the shape, and the higher frequency waves serve to square out the corners. It’s hard to imagine what removing the blue wave from the signal would look like, but it should be clear that without that low frequency component, our signal is going to change dramatically. 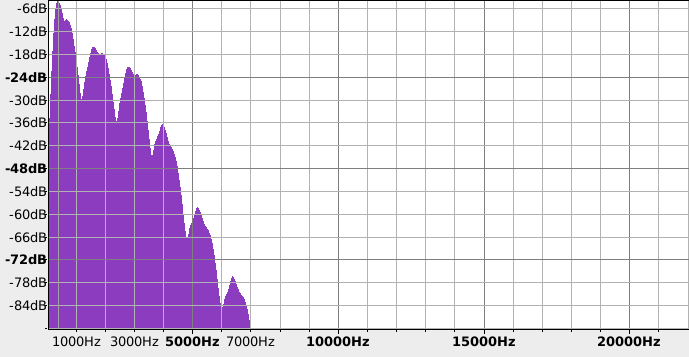 To simulate the effect of sending a signal through a channel designed for speech, we want to remove frequencies outside of the range 300 Hz to 3400 Hz. Audacity makes it easy to perform this experiment. 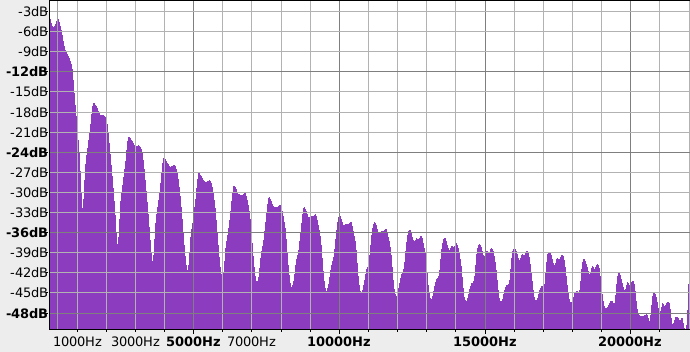 Unfiltered stackmat signal frequency analysis. Note the bias towards low frequency signals. Now we apply a band pass filter that attenuates all frequencies between 300 Hz and 3400 Hz. Note that we’re not harshly cutting off all frequencies outside of this range, they are dampened instead. This is a reasonable approximation of what happens in the real world: devices gradually lose sensitivity to frequencies outside of their operating range, rather than dropping off entirely. The resulting signal looks very similar to the distorted signal we saw when plugging the stackmat into a phone! 300 Hz - 3400 Hz band pass filter frequency analysis. 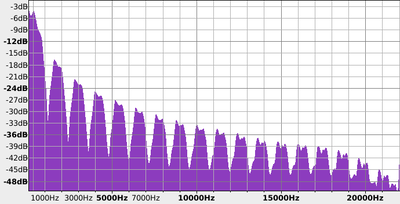 Note that a lot of the higher frequencies are gone, and the very lowest frequencies have dropped off. If you’re interested in how different phones handle the stackmat signal, please see all these signals I’ve collected. This begs the question: how do you translate the stackmat signal into a range of frequencies that phones do support? It turns out this problem (transmission of digital bits over a link designed for human voice) has already been solved. You use a modem! The word modem is actually a portmanteau of the words modulator and demodulator. The original modems used a modulation scheme called frequency-shift keying (FSK) that is surprisingly simple. Pick two distinct frequencies. Call one your mark frequency, it represents a binary 1. Call the other your space frequency, it represents a binary 0. 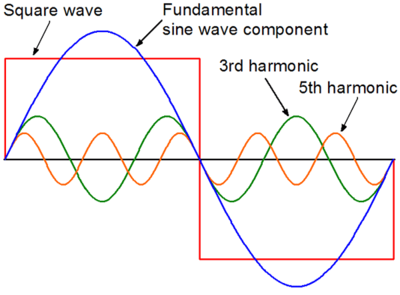 Whenever your digital signal is a 1, send the mark tone, and whenever your digital signal is a 0, send the space tone. If the mark and space frequencies you chose are within the range of frequencies that phones support, you’re golden. In the previous picture, the top signal represents the stackmat signal. The “mo” part of a modem would take this signal and produce the wavy bottom signal (FSK encoded). If we chose our mark and space frequencies correctly, then the FSK encoded signal is safe to run into a smartphone, which would then recover the original bits by doing frequency analysis in software. Eithan did some research, and discovered the DS8500 HART Modem. It produces frequencies of 1200 Hz and 2200 Hz, perfect for a phone. I was very skeptical that it would be able to speak the digital signal stackmats produce, but measurements of the stackmat’s digital output voltage were exactly the voltages the DS8500 data sheet asks for. The chip is only $12, why not give it a shot? 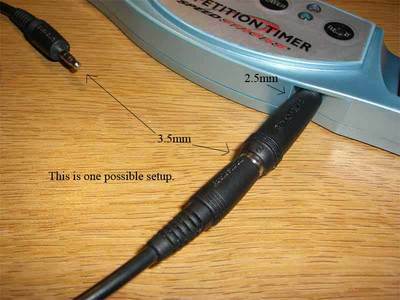 Unfortunately, using chips is not as simple as plug and play. 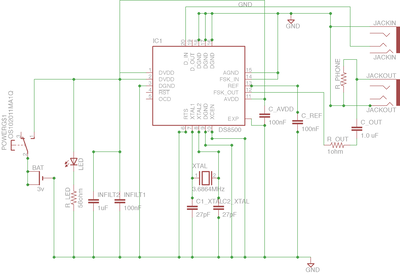 Among other things, the DS8500 requires an input signal of 3.6864 MHz. 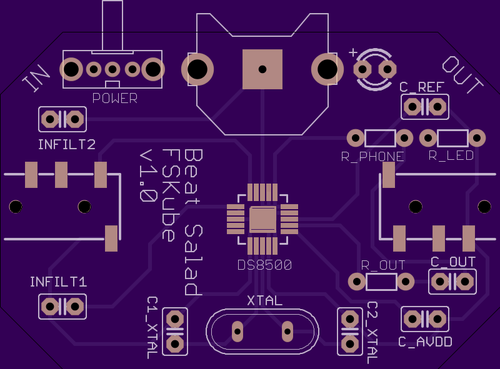 Easy, run a current over a piece of quartz, and then filter the output of that through some capacitors. Also resistors. Apparently you need resistors everywhere (I’m convinced that resistors don’t actually do anything other than cost a few pennies and look cool). This was quickly getting out of hand. 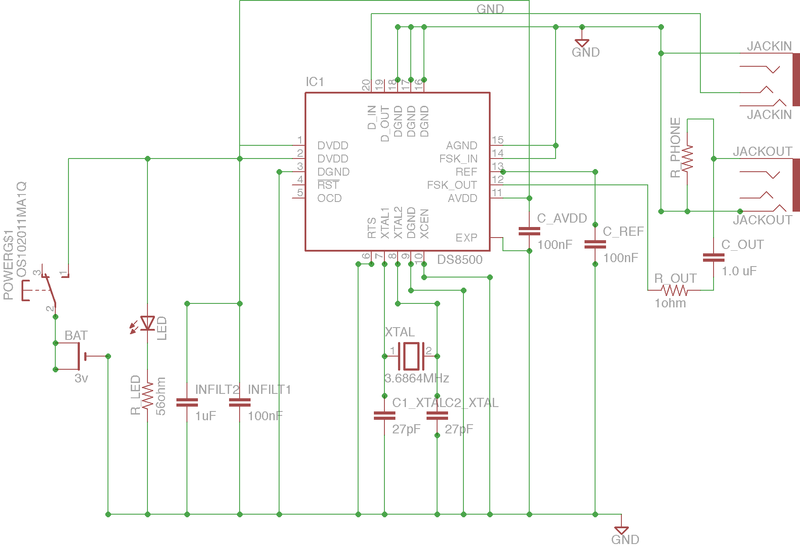 Suffice to say, reading the DS8500 data sheet and distilling that information into a working board requires a degree in EE. Eithan could do it, but he wasn’t sure he could get it right the first time. Fortunately, you can purchase an evaluation kit that has all the necessary components soldered to a DS8500 for you. For $46.86 after tax, the evaluation kit is a rip off (all the components on the board cost pennies, and the chip costs ~$12), but it let us verify the chip without the time and risk of designing and soldering our own board. Wiring up the DS8500. This was tricky! You can see a stackmat plugged into the modem above. I connected the output of the modem into my desktop, Nexus 5, and iPhone 3Gs and recorded the incoming signal. Output of the DS8500 as recorded by my desktop (gerty), a Nexus 5, and an iPhone 3Gs. The top row is the incoming digital signal, the output of a generation 2 stackmat stopped at 0.00. Success!!! The signals recorded by the phones are slightly distorted (we’re still not sure why), but it’s easy to tell where the 0s and 1s are. 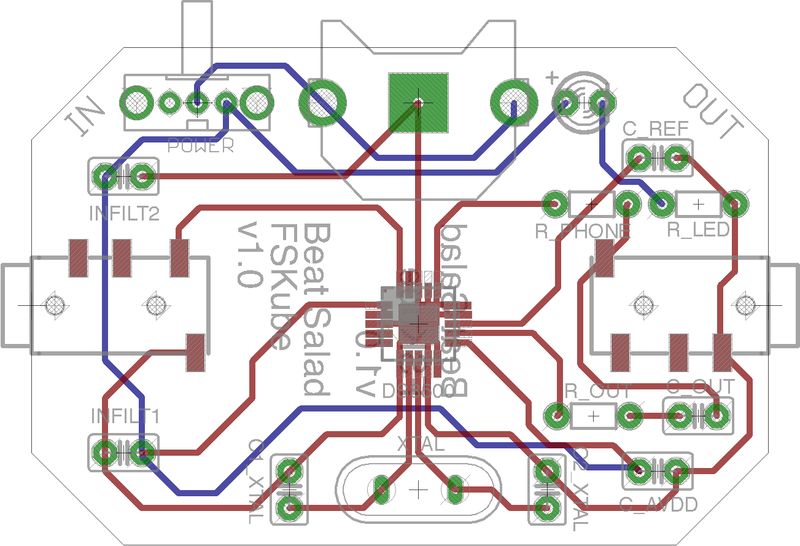 Having proven that the DS8500 does what we want it to, it was time to design our own board (Eagle CAD files available here). We used OSH Park to print the board, which required us to order a minimum of three boards. Eithan wisely insisted that we purchase at least two of each component. Everything for one board cost $26 (see our bill of materials). If we move onto mass production, the price should go down significantly. 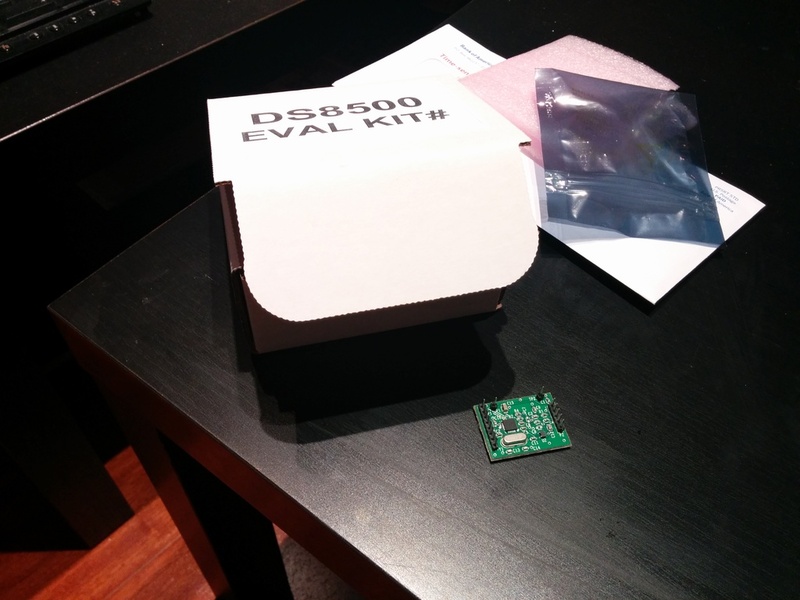 It wasn’t until everything arrived that we realized just how small the DS8500 chip is. 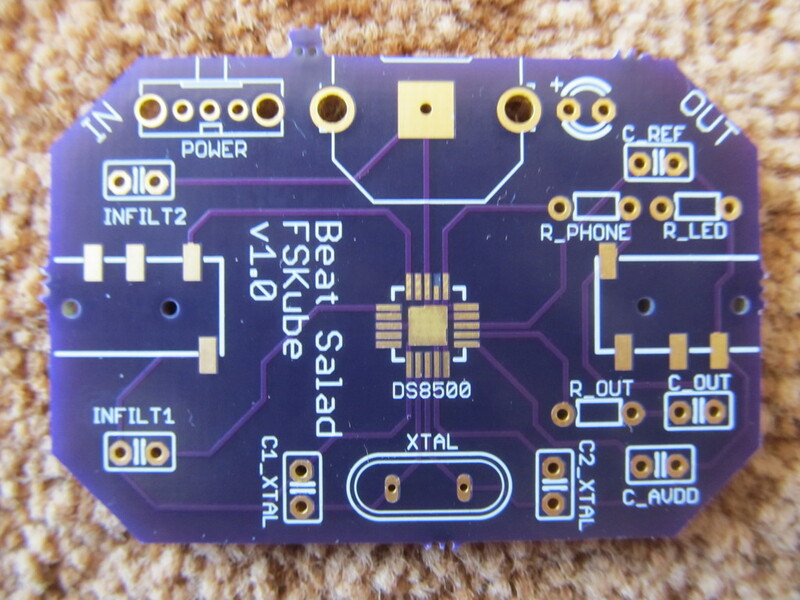 We had no idea how we were going to solder it to the board. Could this be any tinier please? Fortunately, we found a coworker on the hardware team who does board work. 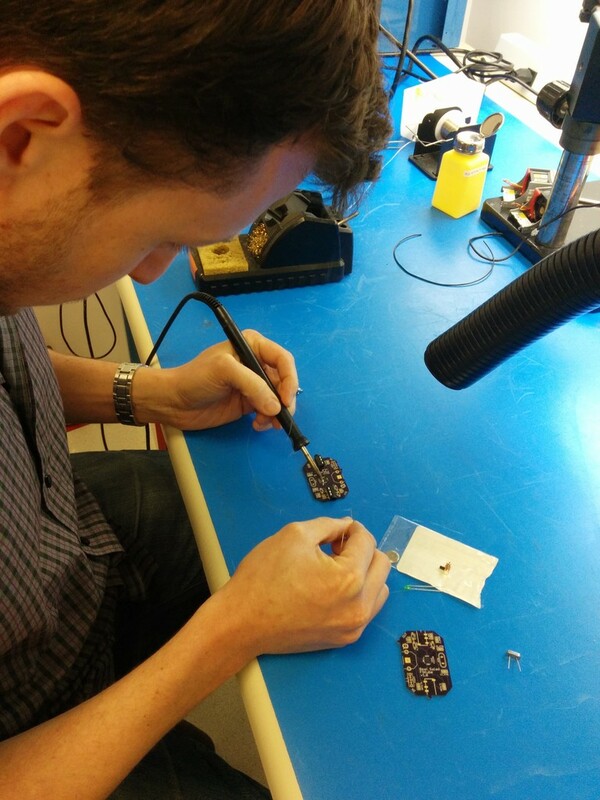 Part of his job includes soldering these ridiculous TQFN packages. We gave him two of our boards and our two DS8500 chips. He attempted to solder the first one using a hot air gun, but the board cracked (our two layer board is a lot thinner than the boards he is used to working with). 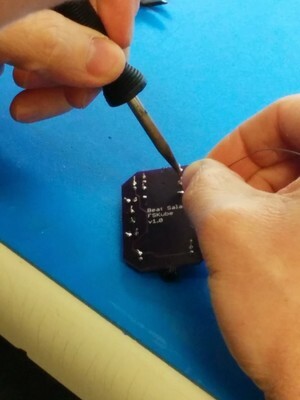 He soldered the second chip by hand, which meant that he couldn’t solder the “bellypad” (the large metal contact visible in the previous picture). 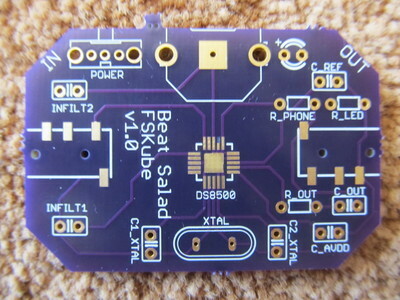 Since the bellypad is labelled as a ground, and many of the contacts on the outside of the chip are also labelled as ground, we hoped that just soldering the outside would be good enough. 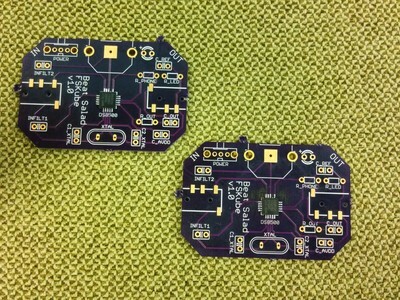 Boards with the DS8500 soldered on. Note that the lower right board is charred and cracked from the hot air treatment. After that, it was a simple matter of letting Eithan do all the work. Eithan soldering the through hole components. Neither board worked at first. 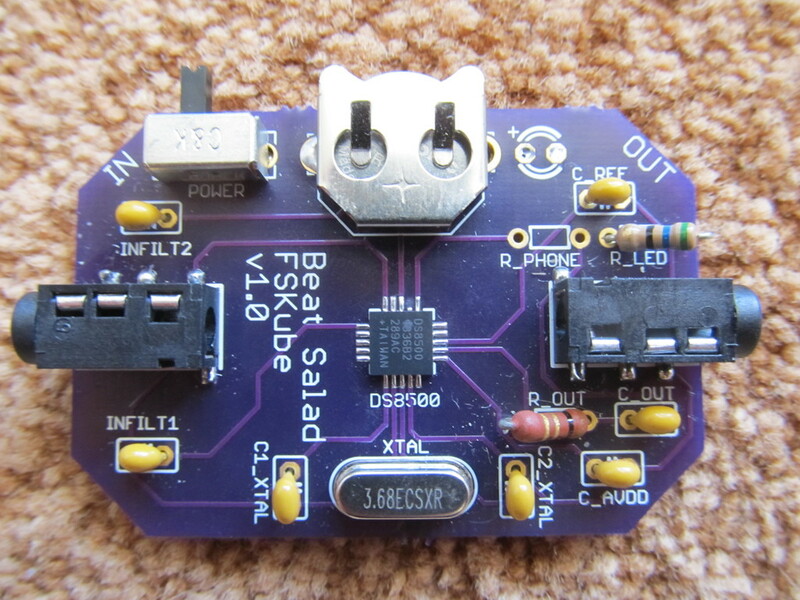 The board design called for an LED to indicate when the modem is turned on. The combination of modem and LED drew more power than our battery could supply. After removing the LED, the burnt board still didn’t work, presumably because the modem had been damaged by the heat. This left us with one working board. This is just the beginning. There is a lot of work to do before we can run a competition with our phones. I aim to start running small practice competitions with the Berkeley Cube Club in early 2015. 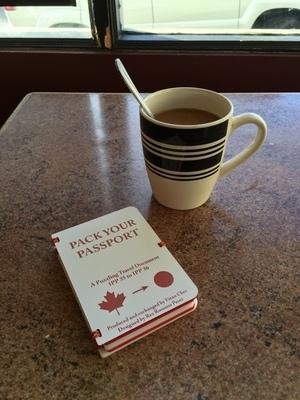 I intend to see this project though until it can be used at a large scale competition such as US Nationals or Worlds. Test on more devices, especially iPhones. 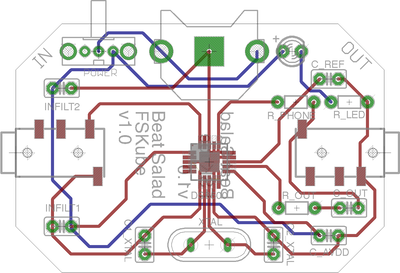 Design a new board for mass production. If you happen to know anything about getting boards mass produced, please drop me a line! I’m very out of my element here. Integration with a live results system for WCA competitions. Eithan Shavit for teaching me everything I know about hardware and electricity (that’s still not very much, but that’s not his fault). Patricia Li for encouragement and for proof reading. She also wrote the skeleton of the Android demo app. What does a TI-83+ have in common with a stackmat? It started with a coincidence: the stackmat and the TI-83+ have the same 2.5mm communication port. 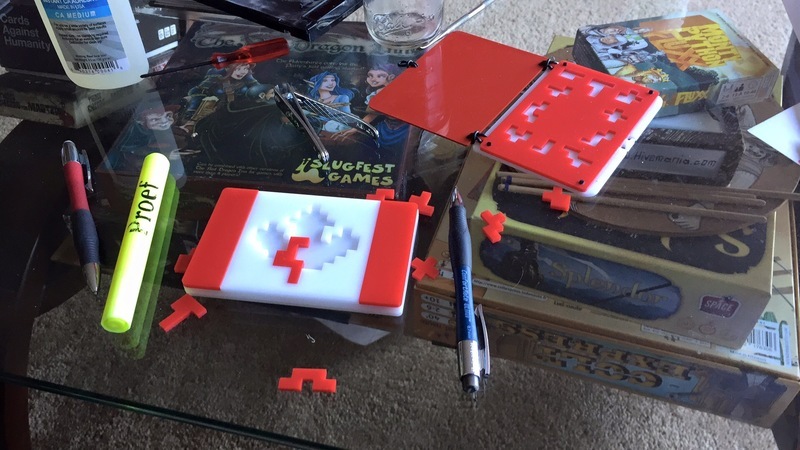 If you haven’t heard of a stackmat, it’s the timer used in Rubik’s Cube competitions. I first played with one at Caltech Spring 2005. After the competition, I convinced my mom to buy me one. Before I started speedcubing, I was very into calculator programming. Outside of the time I spent using my beloved TI-83+ to do actual math, I spent hundreds of hours and untold AAA batteries programming on that overpriced device with its cramped keyboard. When I learned that some people had managed to wire a PS/2 keyboard to their calculators, it was something I had to try out. I bought all the components needed for the project, but a general lack of EE knowledge meant that I never actually got the project working, and my mom eventually made me move the mess into our garage. The upshot of all this is that when my stackmat arrived, I already had the adapter and cables to plug my stackmat into my computer via the microphone jack. I wanted to practice with my new stackmat, but I also wanted to keep track of my times without manually entering them into my computer. I scoured the internet for a program to interpret the sound of my stackmat. To my great surprise, I couldn’t find any! To this day, I believe I was the first person to try this. I graduated from high school in 2006, and spent some time that summer deciphering the stackmat protocol. I’ll never forget the thrill of zooming into a recording and seeing a repeated waveform. After a long time staring at screenshots from Audacity, I was able to decode stackmat signals by hand (many years later, I learned that I had reverse engineered the RS-232 standard). Friends and other projects kept me from writing a software signal interpreter that summer. It wasn’t until I had settled into my freshman year of college that I finally sat down and coded a truly awful, barely working stackmat interpreter in Java. I kept this project secret, confiding only in Darren Kwong. I decided to demonstrate my work at Berkeley’s first Rubik’s Cube competition, Berkeley Fall 2006. Of course, that didn’t happen. I had never staffed a competition before, but there’s rarely a moment of free time. Berkeley’s first competition was no exception. Fortunately, we all met up at Dan Dzoan’s apartment afterwards, and I was able to show off my hard work. I like to think that people were impressed and excited about my work, but I honestly only remember the reactions of two people: Chris Hunt, and Ryan Zheng. Chris Hunt was the creator of the legendary JNetCube. At the time, almost every cuber I knew used JNetCube. He proposed adding my stackmat support to it, and I remember being honored by the opportunity to contribute to a real piece of software that other people use. I’m sure I would have become a contributor to JNetCube if not for Ryan Zheng. Ryan wanted to see my awful code, and then felt compelled to improve it. 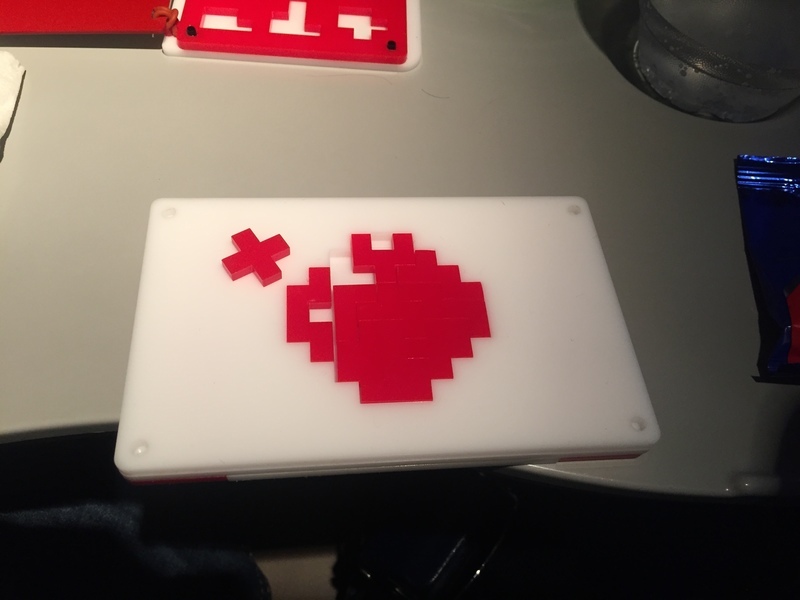 He eventually pulled out his own laptop, and we descended into a full night of hacking. That night lengthened into a full weekend. At one point, Ryan suggested the unthinkable: rather than just giving this feature to JNetCube, we could build our own superior timer! That moment was the birth of C.A.L. Cube Timer (CCT). 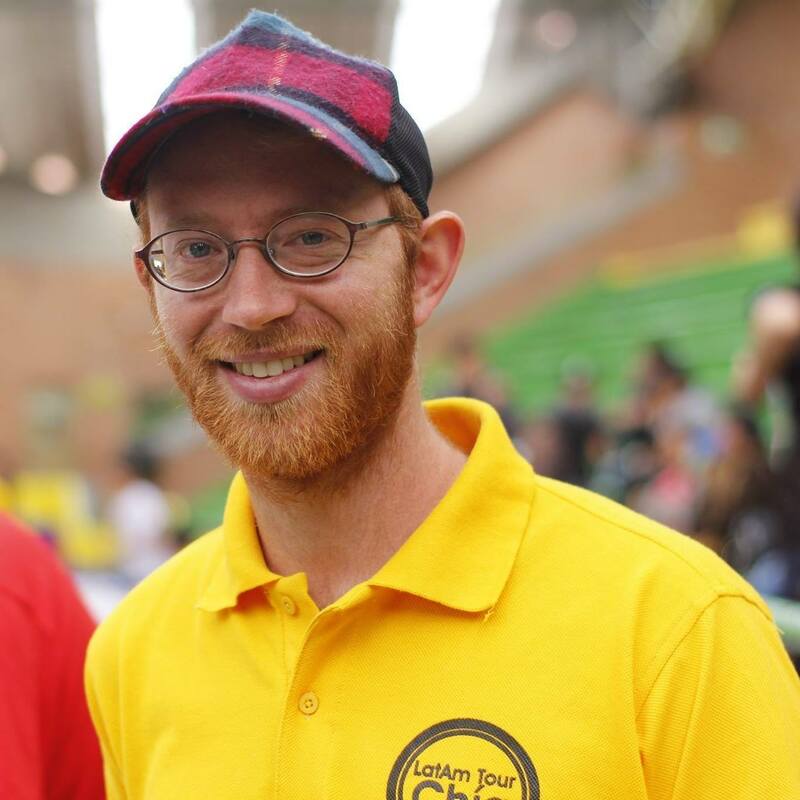 CCT received a lot of attention from the cubing community, and we worked for years to keep up with the requests. Many features that were first introduced in CCT live on in the the myriad cube timers we have today. Perhaps my proudest moment was seeing this video of a Chinese cuber using a translated version of CCT. CCT eventually grew into TNoodle, the official WCA scrambling program. I am very proud of TNoodle, and it gives me great joy to know that it is used weekly as part of running official Rubik’s Cube competitions.